The imageCLASS D860 is intended for offices that require robust copier and laser printer functionality with virtually maintenance-free performance. 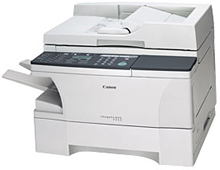 This device offers enhanced output speeds, copying at 18 copy-per-minute (cpm) and printing at 16 page-per-minute (ppm) for Letter-size documents. It offers fast, efficient paper handling through a 500-sheet front-loading paper cassette, 100-sheet multipurpose tray, which accepts a variety of media, and a 30-sheet Automatic Document Feeder (ADF) for multi-page originals. The D860 can copy up to 8.5 inches x 14 inches (legal) from both the ADF and platen glass. In addition, the machine incorporates Canon's Advanced Printing Technology (CAPT) for the highest-quality laser printing performance. For added flexibility and user convenience, the D860 supports both parallel and USB interfaces, which are network capable with an optional print server.